Please join us for Sunday services at 10:00 am, followed by a fellowship hour at 11:00am All are welcome to attend. Communion is served on the first and third Sundays of the month. 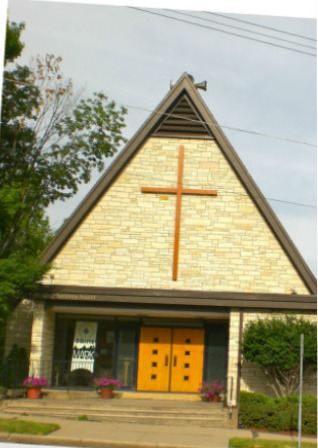 NOTE: Services falling on the 5th Sunday of the month are shared services with Saint Luke Lutheran Church, located at 1807 Field Avenue in St. Paul. These shared services alternate between St. Mark and St. Luke and begin at 9:30 am. NOTE: The service on March 31, 2019 will be held at St. Mark Evangelical Lutheran Church. NOTE: Lenten Services (through Palm Sunday) can be found under "Events." We have been serving the West Seventh Street community of Saint Paul for over 100 years. Our church home is one mile southwest of the Xcel Energy Center on West Seventh Street, directly across from Mancini’s. We have a friendly congregation with deep roots in the community. Worship service is mostly traditional with special services throughout the year. The choir is complemented by an authentic pipe organ. Children are always welcome for service!